Mike Cartwright Shines On! « Shine On! Kids - Supporting children with cancer and other serious illnesses in Japan and their families. Mike Cartwright joined Team Beads of Courage this year, and has already carried beads in seven marathons. Team Beads of Courage allows athletes to directly encourage and honor a children’s fight against cancer; a participant carries a pair of beads to the end of their journey, sending one bead to a child in the hospital along with a note of encouragement and keeping the other bead as a reminder of that child’s struggle. Mike will continue to carry the beads in future marathons, hoping to inspire children to remain persistent in the face of obstacles. About Mike: Before he began running, Mike was working seven days a week for the Hong Kong Police. Deciding he needed a new hobby and an escape from work, he formed a small running group with his friends and began actively training for marathons. He ran his first international marathon in Beijing, finishing just under five hours. 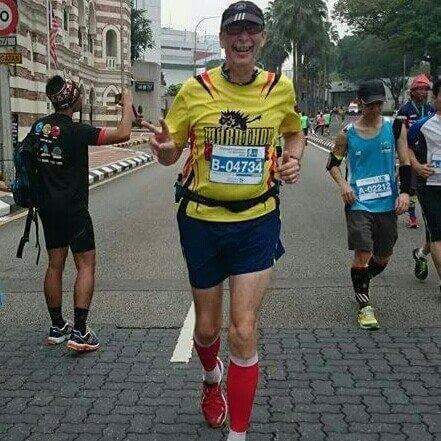 Today, he runs at least two marathons a month, and has just finished his 100th marathon in Phuket, Thailand. Team Beads of Courage is not Mike’s first volunteer experience. Shortly after he began training, he founded a Breakthrough Running Group for kids in need of guidance. He believes that running improves kids’ thinking skills and motivates them in other areas of life. In addition, he organized charity runs in Hong Kong to raise money for the Japanese Tsunami, the Sichuan earthquake and the Pakistan flooding.